So you want to go freelance. Say goodbye to working for “the man” in the confines of an office and say hello to working on your own schedule, marching to the beat of your own drum, and having the rewards of all your hard work go straight into your own pocket and not someone elses. But it isn’t that simple. To be a successful freelancer, you have to be able to wear a lot of different hats and be willing to hustle to be able to truly enjoy the “free” part of freelancing. I wrote this guide because I wish I had it when I went freelance in 2008. I went from being a salaried graphic designer in an agency to doubling my income in one year and eventually growing it into a full blown agency. I’ve made a lot of mistakes over the years along with some really good decisions, and I’m ready to share them with you so you can branch off on your own and have a more fulfilling career being your own boss. How do you run a business while working full time? It’s not easy, but it’s an important starting point if your goal is to eventually branch off on your own. 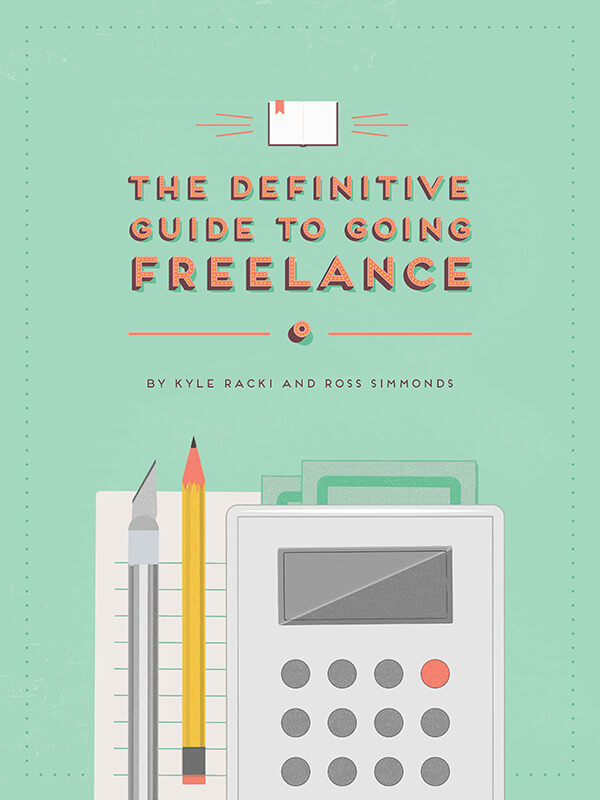 This intro chapter shows what the risks and rewards of freelance bring, and how to get started when you’re already employed. The most important step in going freelance is quitting your full time job and taking the plunge! Saying goodbye to your regular salary is a scary thing, and it’s what keeps many professionals clinging onto their salaried position. This chapter shows how to face your fear and make that important step. Charging what you’re worth is critical in order to run a sustainable freelance business. After reading this chapter, you’re going to know what you need to do to price your services in a way that benefits both you and your clients. Like any business, marketing is critical to driving new leads into your sales funnel. But marketing a freelance business is different than marketing an agency or another type of company. This chapter shows the right - and wrong - ways to get your name out there in front of potential clients. Getting the phone ringing (or more likely, filling up your inbox) with potential clients is only the first step. You actually need to convert them into paying clients! But you also have to be careful to evaluate every new lead to make sure they would actually make a good client for you. Then you need to stand out from your competition with an effective proposal to close the deal. Going freelance can sometimes feel like you’ve been dropped onto a desert island to fend for yourself. And it kind of is like that minus the threat of spiders (you can still have a beach ball as a pal though). You need to create a solid process to ensure high quality work gets pushed through the door in a timely manner. This chapter explains how. Clients are the lifeblood of your freelance business. Without them you’re back to 9 to 5. However, like a double-edged sword, clients are both absolutely indispensable but can often be a major cause for frustration if not properly chosen and managed. This chapter explains how to keep your clients happy without compromising your time or professionalism. Cash-flow is king in the world of freelance. Why? Because you don’t have a steady paycheque rolling in every two weeks anymore. That means you need to collect on invoices, plan for taxes and minimize your expenses while maximizing your billable hours. This chapter walks through the necessary evil of managing the books. To keep clients happy and keep steady money rolling in you need to manage your time effectively. This can be a challenge when you don’t have a boss looking over your shoulder throughout the day. The reality is that being productive as a freelancer is a major challenge. This chapter walks through some life hacks that will help you keep your eye on the ball. Having an awesome lifestyle was the reason you went freelance in the first place. Why then do so many freelancers end up becoming victims of their own success and stay confined to their desks working 24/7? This chapter shows how to control your business instead of letting your business control you.